Mature gooseberries are about 5' high and wide, currants a little larger. Standards and cordons are also available. Gooseberries are: green, yellow, white or red; smooth or hairy; carried as large single berries; cooking or dessert. Currants: red or white, the white is a 'sport' of the red; currants carried in sprigs. Self-fertile as well as insect-pollinated so a single bush can be planted, i.e. there is no need for a second bush to pollinate. Slightly acid, well-drained soil is best. Like a sunny site but can cope with some shade. Better to plant bare-rooted bushes in November but can cope with February-March planting. Pruning in winter recommended: cut out diseased wood and keep centre open; cut back new growth on leaders by a half, cut back side shoots on leaders to 2". If growth has been vigorous, cut back side shoots in summer. Thick gloves advisable with very thorny varieties of gooseberry. Keep weed-free by pulling weeds up. Do not hoe or roots will be damaged. 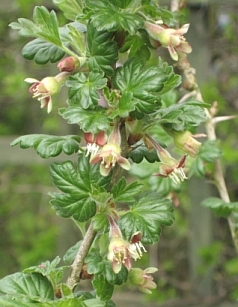 Birds tend to ignore the cooking gooseberries but can go for the buds in late winter. Have started to take red gooseberries so it is now necessary to net these. May be necessary to net currants, depends if birds realise that white currants are there. Keep an eye out for greenfly and contain in early stages - squash! American mildew: white powder appears on young leaves and shoots, then on fruit, eventually powder turns brown. Destroy affected branches in September. Make sure that branches are relatively open and do not plant bushes too close. Brown scorch: edges of leaves turn brown, growth stunted, fruit small - due to potash deficiency - use a tomato fertiliser. Sawfly - small creamy-green caterpillars can totally defoliate a bush in a very short time. Keep watch and squash on sight! Aphids are the major problem. Sawfly is an occasional problem but less so than with gooseberries. Thornless bush, vigorous, grows to 5' in height and breadth. Fruit are similar to gooseberry with the black-purple colour of the blackcurrant. Can be eaten raw or cooked with flavour similar to blackcurrants but less tart. 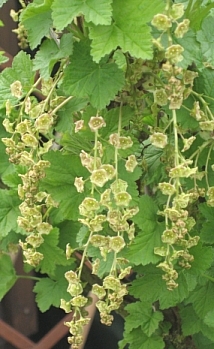 Is self-fertile like gooseberries and can be harvested in its 3rd year. Said to be resistant to diseases of parents, e.g. mildew.